We’ve all had that moment of scramble when you’re digging through your glovebox, without taking your eyes off the road, for a pair of sunglasses after you realize that the sun is extremely bright. Instead of that, why not let you’re your sun visor do the work? The Driver’s See Through Sun Visor turns your sun visor into sunglasses. Instead of the normal non see through sun visor, this one is made from tinted polycarbonate and will keep your looking balls safe from the sun’s evil glare whether it be in the early morning or the evening. It works exactly like a normal visor. It’s attached to your car and you flip it down. Easy. 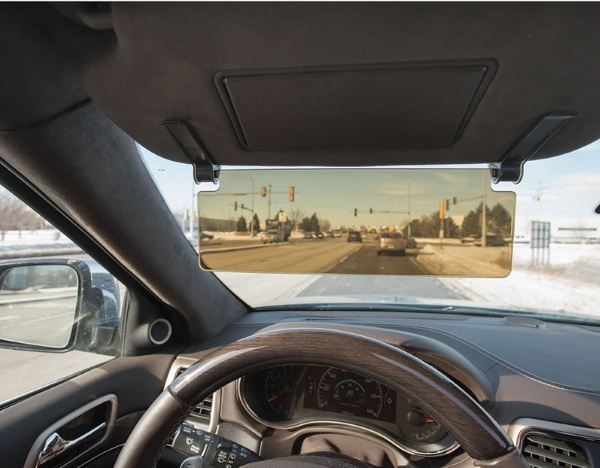 Installing this means you never have to worry about having your vision obstructed by the sun or by the item that’s supposed to be helping you block the sun. It is smoke colored and to clean it from the inevitable fingerprints that are coming, all you need to do is wipe it clean. The Driver’s See Through Sun Visor is $19.95 but will save you a bundle on sunglasses. Yeah but is it polarized? ?